Every summer, under a crisp, sunny summer sky, serious faces study programs, debate odds and circle sure winners in the racing form. There are a few minutes to post as my family mills around, each one with an ink pen at the ready. It’s our annual Uncle George Day at the horse races. This group of about 20 is focused on how to parlay two dollars into two hundred. Everyone, that is except me. My winning ticket involves capturing this moment with one snap of my digital camera. Corralling chickens is easier. Hours earlier we set up lawn chairs and spread blankets on Del Mar’s trackside apron in preparation for a picnic of sandwiches, fruit and chips. Gathered alongside my husband, Nick, are our kids and kids by choice. Sisters, brothers, uncles, aunts, nieces, nephews, cousins and long-time friends join in the fun. No one is interested in the future importance of photos chronicling our outing to where the turf meets the surf. More attention is paid to an over-sized bag of kettle corn propped against the cooler. With the images safely stored on my smartphone, everyone moves to their original places. The sound of a trumpet blares in the distance. A few scurry to the betting windows, seemingly mesmerized by names like Briarpatch Betty, Countyourwinnings and Pappaspepper. The younger kids scamper toward the metal fence surrounding the track and watch the horses and their jockeys trot to the starting gate. I breathe a sigh. Another family memory captured for eternity. My gang doesn’t realize it yet, but someday these random snapshots, converted to digital data, will become family treasure. We moms, know. That’s why many of us assume the role of family photographer/historian, with the same seamless leadership and commitment we exhibit as family party planner, nutritionist and chauffeur. And this usually means we’re not in the picture — at least most of the time. That’s a small price to pay in exchange for the satisfaction of having the images of those we love preserved on a sheet of photo paper, tucked into a family album or captured on a computer slide show. I wasn’t always a fan of digital photography. I mistrusted anything I couldn’t drop off at the drugstore for developing. It took nearly a year after receiving a digital camera for Christmas before I traded in my insecure attachment of film rolls for the convenience, efficiency and quality of a digicam. I fell in love with knowing instantaneously whether the photo was good or not. No more waiting days or weeks to find out I had blinked, someone had looked away or one of my sons (or their pals) had photo-bombed the picture. Later that day, while everyone else gathers around the dining room table recapping their winners and losers, I sneak off to my computer to download the candid shots snapped in between races. I linger a moment and after a few mouse clicks, I open a digital slide show of other family events. One son’s first day at kindergarten, their grandmother’s 80th birthday, the sweet smile of a new bride, the joyous birth of a grandchild. It doesn’t matter where the pictures are stored — in an album, on a hard drive or at a photo sharing site. Or whether my face is among the group grinning from the image. I’m part of the moment and the emotion that only a photo can preserve. I smile as the pictures glide past, reminding me of forgotten occasions. Like the sleepy Saturday morning I had awoken everyone early for a family portrait. The professional photographer insisted the light at Coronaod beach was best before the clouds disbursed. Sometime around 7 a.m. Complaints and protests — mostly Nick’s — echoed in my ears. “Why are we up earlier than the sun?” he moaned, as he and our young sons trudged barefoot through the wet sand to reach a sea wall. Wearing rolled-up jeans and white T-shirts, our fivesome posed casually, while the photographer captured our smiles forever. It’s a great portrait. And that time, I was in the picture. By the time the last of the sugar cookies are eaten and all the gift have been unwrapped, we barely have a chance to jot down a resolution or two and reflect on how quickly 2017 has passed. Another year is coming to an end and it’s time to usher in a new one. There are lots of ways to welcome in the New Year. Your family might stay up until midnight to bang pots and pans, pop open a bottle of bubbly and watch the ball drop in New York’s Times Square. Many believe that sharing a kiss at midnight is a sign of good luck. For some folks, the New Year signals a day to relax, watch football and unwind from the flurry of holiday activity. My husband Nick and I review our successes with last year’s resolutions before writing down 10 attainable goals for the coming year. People from all corners of the world participate in many of customs and traditions, unique to their culture and history. Here’s a sampling of some memorable and unique ways to say good-bye to old Father Time and greet Baby New Year. Perhaps you’ll add one or two to your family celebration. If you are in Spain or Portugal for New Year’s Eve, you can share in the local custom of selecting twelve grapes from a bunch. Then as the clock strikes midnight, eat them one at a time making a wishing with each grape as a way to bring good luck for the next twelve months. Latin American countries share this custom. In Northern Portugal children go caroling from home to home and are given treats and coins. In Australia and New Zealand, New Year’s Eve falls when summer is in full-swing. Fireworks symbolize the crossover from New Year’s Eve, marking the end of the old year, to New Year’s Day, which signaling the beginning of the New Year. The largest and most elaborate fireworks occur at midnight in Sydney Harbor, an iconic Australian landmark. On this night, the harbor is lit with spectacular fireworks, where hundreds of cultures unite for the Harbor of Light parade. Because New Zealand is located close to the International Date Line, it is one of the first countries in the world to welcome the New Year. It is celebrated as a day to relax, visit family and friends, perhaps attend a horse racing carnival or other summer day fairs. Instead of football, New Zealanders watch cricket. January 1st is an important date in Greece because it is not only the first day of the New Year but also St. Basil’s Day. A traditional Greek celebration features Vasilopita, a cake with a silver or gold coin baked inside. On New Year’s Day, the cake is sliced as a blessing to the home and to bring good luck for the New Year. The first piece is for St Basil, the second for the house, the next for the most senior member of the household down to the youngest member and often includes absent family members. Whoever finds the coin in their piece of cake will be lucky for the next year. To predict the future, families in Germany and Austria melt a small amount of lead by holding a flame under a tablespoon, then pour the lead into a bowl or bucket of cold water. The resulting pattern is interpreted to predict the coming year. A heart or ring shape means a wedding, a ball means luck will roll your way and a pig signifies plenty of food in the year ahead. Bolivians who want to travel in the New Year must take their luggage to the door of the house or go upstairs. Another custom is to wear your underwear backwards: Red is to be lucky in love; yellow is for wealth. At midnight, Bolivians turn the underwear frontwards symbolizing moving forward into the New Year. Some Bolivian families make beautiful little wood or straw dolls to hang outside their homes to bring good luck. Brazil may be the most celebrated locale to welcome in the New Year. Millions of people from around the world travel to Rio de Janeiro’s shores, especially in Copacabana to experience the majestic fireworks light up the sky above the beaches. Your good luck will increase if you can jump over seven different waves while making your New Year’s wishes, one for each wave. Brazilians believe lentils signify wealth, so on the first day of the New Year they eat lentil soup or lentils and rice. At midnight on New Year’s Eve, Mexican families open the front door and symbolically sweep out the old year before tossing coins on the ground and sweeping them into the house wishing for prosperity in the coming year. To symbolize renewal, Mexicans also throw a bucket of water out the window. The most popular New Year’s Eve song, is actually an old Scottish song. Poet Robert Burns transcribed and refined the lyrics after hearing them sung by an old man He published the song in the 1796 edition “Scots Musical Museum.” “Auld Lang Syne” translates as “old long since” and means “times gone by.” Bandleader Guy Lombardo popularized the song in 1929 and turned it into a New Year’s classic. The birthplace of “Auld Lang Syne” is also the home of Hogmanay, the rousing Scottish New Year’s celebration. Shortly after midnight on New Year’s Eve, neighbors pay visits to each other and impart New Year’s wishes. They are called “first footers” and traditionally, bring along a small gift. You will be especially lucky if a tall, dark and handsome man is the first to enter your house after the New Year is rung in. The Scottish also believe that you should clear your debts before “the bells” ring at midnight. The frustrating thing is, I shouldn’t have been late in the first place. I was ready to walk out the door 15 minutes early. But since I had extra time, I tossed a load in the washing machine and wrote an overdue thank-you note. Presto, now I was running behind. I start out on time, but for some reason, being early often makes me late. It’s like my day is 10 minutes shorter than everyone else’s. The truth is, being a chronic multi-tasker (aka woman/mother/sitie) has impaired my time-management skills. Even though I’ve adopted “Be in the moment” as my personal mantra, more often than not, my actions are focused on reaching the destination instead of enjoying the journey. My husband doesn’t classify me as a woman-in-constant-motion, even though Nick is often the benefactor of my never-waste-a-moment mentality. To him, I move about as fast as — well — as a wife. So several weeks ago when I got pulled over for speeding, he was shocked. In fact, since my speedometer rarely hits 60, Nick agreed that my car must have been the only one the officer could catch. At the time, my mind was on where I was headed; not how fast I was getting there. Luckily the patrolman let me off with a stern warning. Maybe I reminded him of his own wife. I blame my scheduling shortcomings on a high regard for the value of time. I’m committed to squeezing every second out of the day as if I’m crushing oranges so every drop lands in the glass. I know time is precious and I don’t want to waste it. But somehow in my quest to get the most from every moment, I’m often rushed, segmented and rarely able to strike a reasonable balance between using time wisely and staying in the moment. Just a few weeks ago, while going through the afternoon mail, I noticed a long-awaited check for a freelance writing assignment. I opened the envelope, looked at the amount, smiled and then — as any busy woman and mother would do — went on to finish a variety of chores. About a half-hour later I realized I had misplaced the check. Panicked, I retraced my steps. Wow, I had done a lot in those 30 minutes — paid some bills, vacuumed the familyroom, dropped off magazines at the neighbor’s house, fed our dogs, Bandit, Jersey Girl and Bowie. Still, I couldn’t find the check. I was discouraged about losing my hard-earned money, but what really bugged me was how much time I’d wasted looking for that envelope. In my haste to get more done, I’d accomplished less and I was more stressed for my efforts. About an hour later I found the check, tucked inside a stack of papers filed for a future writing assignment. But the reality hit me. Doing several things at once can actually cost more time than it saves — and it doesn’t do much to strengthen long-standing friendships, either. I already have a few changes in mind to get me on the path of doing less and enjoying it more. I’m told the best way to solve any problem is to acknowledge it and then take small steps toward improvement. I already have a few changes in mind to get me on the path of doing less and enjoying it more. For starters, I could replace quick showers with an occasional lingering bubble bath or eat a real breakfast instead of bites of an untoasted Poptart. On days I really want to splurge, I’ll actually read an entire magazine instead of skimming through the pages and ignore that little voice adding items to my “to-do” list. There’s one improvement I’ll definitely make the next time Margaret agrees to meet me for coffee. I’ll leave the house 15 minutes early — no checking e-mail or devising last-minute menu plans. This time she’ll find me sitting at the café table with nothing more to do than sip a warm, chocolatey mocha, happily awaiting her arrival. I have a name and I like it – Claire. From the French for bright and clear. My mother chose it, I’m sure after searching through baby naming books. She fought off pressure to use traditional family names to pick this unique one. For all of her hard work, I’ll bet she’s not happy with the variations it’s undergone. Unlike Elizabeth (Liz, Libby, Beth, etc.) there aren’t a lot of diminutives for Claire. The most memorable attempt was Claircy. (My Godsister Fran is the only one permitted to call me this to my face.) Fortunately it never stuck. I think that’s why my mother chose Claire. There is no nickname. However, mom didn’t think it all the way through. She should have suspected–being a mother of four herself–how my name and my identity would change. She knew what would eventually happen, yet she never shared the secret with me. I’m talking about the inevitable nicknaming every woman endures after becoming a mother. You are now referred to as “the room mom,” “the pitcher’s mom,” “the goalie’s mom,” “the mother of the boy Kayleen has a crush on.” Not quite the moniker bestowed at baptism, and a tough one to fit on a driver’s license. During all of these conversations, there are few attempts to learn the woman’s given name. My friends, on the other hand, have no problem saying my name, no variations included. They call me Claire. Never am I referred to as “that boy’s mother.” With my girlfriends, my identity is never in question. Being mom takes precedence over everything else in my life. It’s the most important work I do and I do it with love. But I wasn’t born a mother. I did have a life (I think) before I had children. I am a person, who’s also a mom. That’s who I was before I became Shawn, Jake and Seth’s mom and now, my new favorite – Windley’s grandmother. With my gal pals, I’m Claire. A person first, a mom and grandmom second. That’s why I need to connect with these ladies regularly – my longtime friends, the Zoo Gals, women providing support and free therapy at the drop of a hat. Our careers changed, however our friendships remained constant. Even though I now live miles away from Laura, Jackie and Elaine, they are as close as an e-mail. When we were young mothers of toddlers who quickly transformed into teens, we would gather for three or four hours, every few months, and allow our mom role to take a back seat. And it felt good. On those occasions I was among people who didn’t think my finest talents lie in making a grilled cheese sandwich. To them I’m wasn’t the originator of the phrase: Pick up your mess! They don’t think the words old and Claire naturally go together. Not one of them ever used the designation annoying when referring to me. At least not when I could hear it. Among the four of us, we mother eight kids. I’m the only grammy so far, but then again, I was the only mommy when our little foursome formed. Still, we never refer to each other as Colin, Jason, Jake or Bryce’s mom. These ladies remember when TV shows were only in black and white. There were maybe three channels, not 300. Like me, they grew up making popcorn in a pot on the stove, not in a bag in the microwave. Our term papers didn’t include Internet references. Caller ID, cell phones, text messages – all things our parents didn’t deal with. These are my friends. Women in the same place, at the same time, who raised our sons the best we could. We know each other as individuals. That’s why I miss our occasional mochas, unlimited popcorn at the movies and Cheesecake Factory outings. Gone are the days when we’d pick a night, meet in the middle of San Diego county and catch up on where our lives have taken us since our last moms’ meeting. Each of us knows the importance of enduring friendships; peers with a history and a commonality of purpose. Now we’re spread across the country from California to New York City, and those monthly opportunities to get together have changed into yearly possibilities. Our children are now adults, a constant reminder of how quickly things change; everything except why being mom is a priority. On those golden occasions, when we are able to reconnect the women behind the mothers, we discover more about ourselves. That’s an important lesson I learned from George, Sadye, Paul and Claire’s mom. Her name is Florence. My husband, Nick, loves macho movies. Anything with John Wayne, Clint Eastwood, Chuck Norris, tanks, horses or car chases will do. While I prefer to watch “An Affair to Remember” for the 20th time, Nick would rather wheel around the TV dial to find a channel showing “The Godfather” or “Rocky.” The odds are in his favor, considering both films have numerous sequels. Which makes me wonder why there’s no “When Harry Meets Sally Again” or “Pretty Woman II”? Movie selection is a delicate area of negotiation in our marriage. Actually, it’s a battle zone where differences in taste can find one of us unhappy at the box office. At upwards of $12 a ticket, combined with the cost of popcorn and Sno-Caps, going to the movies is an expensive proposition. It requires financial and emotional investment. That’s why we need to choose wisely. To his credit, Nick has suffered through a many chick flicks. Over the years, he’s learned to come prepared with a wad of Kleenex. He rates each movie by the number of tissues I use during the matinee. If I’ve gone through 10 or more, he dubs the film a real tearjerker. Since I cry at the drop of a sad McDonald’s commercial, I’m not so sure his tissue scale is an accurate assessment. I still well up every Christmas when Frosty melts. An especially touching phone ad can have me sobbing in seconds. This man who watches all the “Halloween” movies without flinching, has a tough time sitting through love stories with his weepy wife. So how do two adults cross this chasm of movie differences? In a marriage where we’ve agreed on everything from potty training to politics, could our varied tastes in cinema be a deal-breaker? Nope. We’re a forward-thinking couple who puts their marriage first. That’s why we’ve devised these strategies to insure marital movie bliss. 2) Take one for the marriage and tolerate a film that’s not your favorite. I consider this strategy as coming under the heading of the “For better or for worse” part of my marriage vows. 3) My favorite solution: Girls’ Night Out. (AKA: Guys’ Escape From a Chick Flick.) The magic inherent in this strategy is simple. Instead of this wife dragging her beloved husband to a film he’ll hate, I gather my girlfriends to enjoy a romantic comedy or a musical. Why are girlfriends better company at these movies? Well for one thing, my friends don’t mind if I cry. They’re too busy crying themselves– right Joni, Lety, Julie and Helen? A well-done chick flick lets you leave the theatre with a light-hearted ahhhh feeling, instead of a stomach wrenching aw-ful feeling dudes prefer. Chick flicks are the opposite of macho movies — no blood and guts, no one dies a violent death and the girl always gets her man. Guys don’t get it. It’s OK though. They don’t have to. Nick and I appreciate our agreement. Instead of him suffering through movies he thinks are “a little slow”, I put out the call for Girls’ Night Out. Sometimes it’s the soccer/football/baseball moms. Other days, my book club friends make time for these adventures in cinematography. Either way, this wife is committed to keeping her marriage happy, so I’ll do what I have to do. And if that means planning regular chick flick movie dates, so be it. Of course, my steady date has first right of refusal. I’d never see a motion picture with the girls that Nick wants to see. 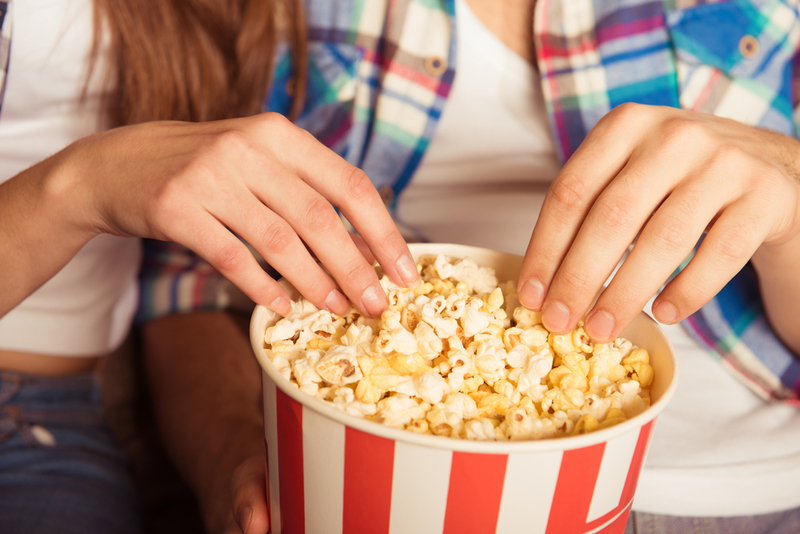 Our movie dates now center on films we both want to see; making us happy, popcorn-eating, soda-drinking cinema patrons, who respect each others viewing preferences. So come on Hollywood, do your part to preserve my relationship. Before you make Rocky VII or Terminator V, produce “Like Water For Chocolate II” and “Sabrina, the Sequel”. The future happiness of my marriage is depending on it. My Deluxe Diet Scale sits on my home office desk. I bought it a dozen or so years ago. It’s one of many tools I’ve collected all promising to help me reach my perfect weight. This ideal number isn’t the same weight I enjoyed in my single days or even the weight I carried on my wedding. No, I’m not that foolish. I know the difference between real and fantasy. My days of weighing less than my bowling score have long passed. I aim toward a sensible weight for my diminutive stature. On the inside I think God made me short for my weight, but that doesn’t help my cause. So, like many women, I struggle with the number that lights up on my digital scale each morning. Yes, it’s that same 5 pounds I’ve tried to lose through four presidential administrations, only now it has doubled. It seems to be gaining momentum, fighting every step of the way to remain a part of me. When I was 12, I didn’t think about how much I weighed or how my clothes fit. 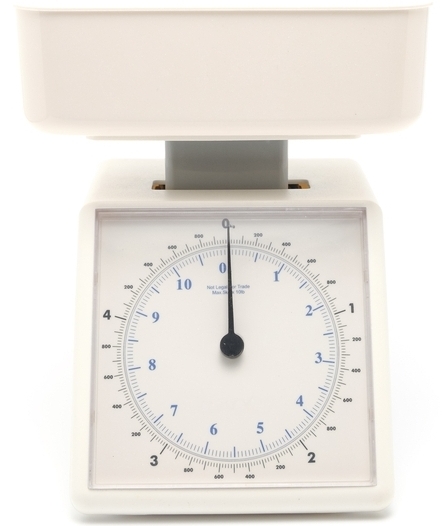 I never climbed on a scale, unless it was at the doctor’s office. The details that filled my mind as a curly-haired preteen were: Does Steve Newton, the handsomest guy in eighth grade, know I exist? How will I finish my report on Chile? What time does the Partridge Family Show start on TV and does David Cassidy have a girl friend? Never a care about the calorie count in a Strawberry Nirvanna Jamba Juice. Who thought about how much fat there is in movie theatre popcorn? Not me. The lesson my mother, Florence, wanted me to learn was that the girl I was mattered more than the girl I looked like. Her buzzwords were: try, try again and always be truthful. There weren’t conversations about being over weight or how I looked. Short of combing my hair and making certain that my teeth were brushed, she never harped on these topics. Sure, I recall mom moving a yellow vinyl-covered, chrome-legged kitchen chair in front of our black-and-white TV where she would do her leg lifts guided by Jack LaLanne. To me, her efforts were more in the spirit of exercise than weight loss. Fitness, not foxy, was the motto,. But times changed and even though it’s not what I learned at home, I have acquired a preoccupation with calories. Was there a time I didn’t know my body mass index? I’m not sure. I think this transformation from happy-go-lucky schoolgirl to appearance-minded career woman happened slowly. It hit somewhere between young bride and seasoned mother. I marvel at this plastic scale. It’s divided evenly in ounces (and grams) and I realize that I haven’t used it for it’s original purpose in a long time. I’m a bit ashamed to admit that in recent years, this measuring tool has been employed more often for weighing letters not linguini. As the price of postage expanded, so did my hips. My doctor offers lots of convincing reasons why it’s important to reach my goal weight. Things like a healthy heart and lower blood pressure top the list. But I think it’s more than playing with my granddaughter, Windley, that inspires me skip the extra serving of guacamole and stay away from the Krispy Kremes. My real motivator, in spite of mom’s insight, is the quest to look young. In this age of face lifts and tummy tucks, who wants to be labeled fat and frumpy? Elastic-waist polyester pants and free-form blouses that aren’t designed to be tucked in, no way. This is the generation of “good-looking, tight-fitting” jeans. I have a waistline and I want to use it. My mind flips back to when I was that young Girl Scout, outfitted in my mint green uniform and dark green sash, dotted with badges. Alongside girls from my troop, I stood in front of the Market Basket grocery store, selling cookies. I didn’t know about trans fats. Nutrition facts weren’t printed on the side panels of the sandwich cookies we pedaled for 50 cents a box. Being together, having friends and sharing a common goal was our priority — that and hoping that Steve Newton would notice one of us. I’ll still use my scale to weigh occasional letters and birthday packages before I send them to out-of-town family and friends. When I pull it out, though, now I’m aware of its intended purpose – an aid in reaching my ideal weight. But a scale can never measure the person I am. Only I can assess that. I know that ideal exists only in my own expectations. This doesn’t mean I’m giving up on watching my weight. I’m no quitter. Of course, I’ll try, try again, no matter which way the scale tips. I think mom would like that. No one confuses me with Martha Stewart. I wish someone would. But when any of my friends wants to create holiday centerpieces using bark, berries and spray-painted soda can holders, I’m not the first phone call they make. I know who they do call–women who turn a sprig of rosemary, three candles and a leftover Cool Whip bowl into a sight to behold. Through my green-tinged brown eyes, I admire those ladies. I barely grit my teeth when I receive their handmade holiday card and note how everyone in the family photo– even the dog–looks fabulous. I don’t know where I was when elegance, artistry and style were being handed out. I must have been standing in the make-magic-out-of-mushroom-soup line. It’s not that I don’t admire creativity in others. Just the opposite. I’m the first one to offer a flattering comment. I’ll ask the neighborhood artisan what inspired her to place 50 floating candles in the backyard birdbath at the Fourth of July barbecue. I’m not the least bit jealous. I’m realistic. I know that if I re-created the same thing, I’d end up with 49 wet candles and a bird on fire. Still I try. I want my family to have cozy, pleasant memories of their childhood Christmases. When they were young, I envisioned my three sons, Shawn, Jake and Seth, contently huddled around our hearth, stringing popcorn and hanging ornaments. Our joyful voices would be singing all the verses to the 12 Days of Christmas or taking turns reading the Polar Express. Of course, this never happened. A more likely scenario: they boys were in the driveway, playing basketball and discussing the Chargers’ playoff possibilities and how their fantasy teams were doing while I hung stockings over the fireplace. Nevertheless, as a mom, and now a grandmother, I’m always looking for crafty, memory-making activities that bring a loving family together. That’s why an ever-growing pile of easy-to-make holiday craft instructions inhabits a corner of my TV room. There are piles of pages I’ve collected from numerous issues of Family Circle, Better Homes & Gardens and Good Housekeeping. The only thing larger than this stack is my intention to actually make one of these projects, one of these years with Windley, my granddaughter. My talents don’t excel in the cooking and baking department, either. Whenever I got stuck roasting the big bird, my first step was callingl my sister, Sadye (the former Home Ec teacher), pleading for a quick lesson in stuffing preparation and a refresher on how to truss a turkey. Now that call goes to Sweet Sue, who has been instrumental in my recent mashed potato success. Windley will soon learn that her Sitie’s gingerbread houses, complete with gumdrops and licorice, come from a kit. The fact that I’m artistically impaired hasn’t diminished my passion for the holidays. My well-worn DVDs of It’s a Wonderful Life and Miracle on 34th Street were cued up and ready to go by December 1. I’ll watch Frosty the Snowman holding a fresh box of Kleenex, because I always cry when Frosty melts. Luckily, Christmas is not a season reserved exclusively for the creative. It’s also for the spiritual, the trusting and the sensitive. It’s for the tranquil, the disorganized and the easy-going. So, I’ve made peace with the fact that my home –complete with the artificial scents of pine and peppermint wafting through my kitchen — will never be a model for a Norman Rockwell-esque illustration. My somewhat tilted tree, decorated mostly with kindergarten art projects and my mother’s ornaments, won’t be featured in the Christmas issue of House Beautiful. And it’s OK.
I’m committing myself to a simpler, kinder Christmas; changing my attitude to embrace a gentler spirit of the season. One that doesn’t have me tracking super sales that started before the sun came up. Yes, my cranberries come from a can instead of from the farmers’ market and I haven’t mailed all my packages by December 17. Christmas isn’t intended to be a test of stress, but instead an awareness of our blessings. That’s why I smile as I search for a mall parking spot. I overcome the urge to elbow the lady reaching over me for a free sample in Costco. Christmas is about enjoying the moments, whether they come with linen napkins and fine China or paper towels and Styrofoam plates. The holidays are for being with family and friends. A time to honor your faith and reaffirm your beliefs. Thank goodness for this pause in the hustle and bustle of life, this gentle reminder to recall past Christmases, savor the present and ponder what the future might bring. As mothers, we hope our children will reminisce about what Christmas was like at home when they were small. That their holiday memories are filled with a magic and delight that brought satisfied smiles to their faces. My three sons are grown now and have begun their own Christmas customs and I’m filled with a new joy watching as their traditions unfold. I eagerly anticipate the day when Shawn tells his now his ten-month-old daughter what Christmas morning was like when he was little. I hope that conversation includes a glimmer in his eye as he recalls leaving carrots for Santa’s reindeer or the excitement of choosing one gift to open on Christmas Eve. All of these small details make up the wonder and peace of Christmas. My mother’s laugh and the blending aromas of sugar cookies, pine needles and baked ham, that’s where Christmas lives in my memory. It’s a sure bet Shawn and my beautiful daughter-in-law, Lisa, won’t be recapping for Windley the first time they tasted my candied yams . It is possible, though, that I’ll get a shout out for my Chex Mix. It’s not fancy. It uses five ingredients, and you won’t find it in the Joy of Cooking. Still, “Aunt Sadye’s Mac & Cheese” is the #1 most requested meal in my home. I’ve served it over and over since my sister, Sadye, first shared it with me years ago. It had been her son, Thomas’s favorite dinner. I know the recipe by heart, yet I pull out the card — tattered and oil-stained — and read the directions written in her hand. Eager to help a young bride on the road to becoming a good cook, my sis had tucked a blank recipe card inside each invitation to my bridal shower. Along with dishtowels, waffle irons and food processors, guests supplied me with their family’s treasured recipes. I keep this personalized cookbook-in-a-can on a shelf near my stove in the Favorite Recipe file Sadye also supplied. Some recipes I’ve mastered: Chocolate Refrigerator Cake (Sara), Meat Loaf (Carole), Hummus (Mom), Stew (Melissa), Refried Beans (Cara), Chinese Chicken Salad (Sue). Some I haven’t: Cioppino (Mary), Chicken Kiev (Laura). During the hustle and bustle of a normal week — when the goal is nutritious, plentiful and fast — I turn to online recipe sites to expand my menu options. Quick dinners like spaghetti chicken, sloppy joes and taquito casserole satisfy the hunger pangs of my husband Nick, and any of my kids who may be loitering around the house at dinnertime. Over the years, a few of those meals-in-minutes made it into our family’s food hall-of-fame recipe file. At the start of the holiday season, I comb through my handpicked collection searching for Christmas cookie ideas. Maybe this year I’ll try Jane’s Chewy Rolo Cookie Bars or Elena’s Snickerdoodles. I reacquaint myself with the secret ingredients in Sweet Sue Potatoes. Since my Mom always added an extra clove or two (or three) to her hummus recipe, I make sure I have extra cloves in my refrigerator. I pull out the Chex Party Mix recipe, knowing that disappointed faces would multiply if bowls of the crunchy stuff didn’t dot the end tables and countertops of my home in the days leading up to Christmas. The recipe, hastily cut from a cereal box, now boasts scribbled additions, critiques and requests (flaming hot Cheetos for Seth, Bugles for Lisa and less wheat Chex for Rachel). This year, my great-niece and able assistant, Britton, wants to add M&Ms to the concoction. Right after Thanksgiving, my shopping list fills with items purchased only once a year (garlic bagel chips, pistachio pudding, red food dye, sugar cookie dough) to prepare the dishes my family eagerly anticipates and expects as part of the Christmas season’s menu. It’s not that my family is overly attached to macaroni noodles and cheddar cheese or green beans and crunchy onions. It’s the aromas, the textures and the flavors of the holidays they anticipate and savor–the ones that don’t feel or mean the same in March or September. Whether we’re curled up on the couch watching “Miracle on 34th Street” or gathered around the dinning room table giving thanks, our taste buds savor the cuisine, but our hearts crave the memories. These are the moments when cooks are preparing more than sustenance. Eating is more than nourishment. Secrets are handed down mother to daughter, sister to sister, friend to friend. Complicated meals that we don’t find time to prepare on a lazy summer day, are the focus of December afternoons. Families gather to assemble tamales using Grandma’s traditional recipe. Batches of breakfast strata are whipped up effortlessly. For many holiday seasons, the womenfolk in my family scheduled an annual baklawa-making event at my niece Denise’s home. (The Greeks call this decadent dessert baklava.) We would spend hours chopping pistachios, tediously hand-brushing paper-thin phyllo dough and gingerly layering the nut, sugar and cinnamon mixture in between the flaky folds. By the time honey is poured over the diamond-shaped slices and trays of the rich pastry are popped into the oven, generous helpings of laughter, wisdom and love have been exchanged. With a little effort, homespun recipes transform into a gourmet diary, a family food history. All the shopping, the measuring, the secret ingredients are recorded on 3×5 index cards, that begin From the Kitchen of… and end with …serves 4-6. They’re handwritten by sitie, a special aunt, a niece, a brother, a godmother, a long-time friend. This tried-and true formula ultimately combines to satisfy hearts as well as tummies. Maybe I’ll make a memory tonight, starting with Mom’s hummus. Hope I have enough garlic. With the jubilance of Queen’s “We Are the Champions” playing in my mind, I dipped my hosted onion ring into a tasty pool of ranch dressing. This was a moment to savor – collecting on a lunch bet from my long-time friend Tony. During our many history of pitting our baseball or football teams against one another, this was one of my few victories. My triumphant mood, though, was quickly erased like yesterday’s box scores. Replacing it — an awkward feelings of a skinny fifth grade girl standing on the volleyball court anxiously waiting to be picked. Choking down my last bit of onion ring, I hurried to explain that I’d joined to contact a friend I’d lost touch with. Outwardly I blamed Vicki, my one and only FB friend, for the embarrassment. Inwardly, those four simple words – you have one friend – sat on my stomach like an expanding weight, daring me to defend my popularity. Savvy Internet users thought my lifetime of experience yielded one lone friend. An off-the-cuff observation reduced me from a confident wife, mother and grandmother to an insecure ten-year-old whose happiness was measured by the width of her circle of friends. I thought it was pretty amazing that I had any presence on this phenomenon of a social-networking site. I’d heard of Facebook. My sons, Shawn, Jake and Seth, a long time ago had MySpace pages, but until lunch that day, I never saw the value of getting involved. Tony’s cavalier comment had launched me, head first, into the intricacies of social networking. For days I surfed the web, clicking, searching and tinkering my way through the online communities. Before I knew it, I was writing on Tony’s wall, re-tweeting posts on Twitter and uploading links. I also learned that the reasons people join these sites are as varied as the folks themselves. After sending out some friend requests and joining the SDSU alumni group, I couldn’t help but wonder if anyone else had hitched up to quell their elementary school ghosts. In my urgency to prove that I was a likeable sort, I’d stumbled on an instantaneous way to stay connected. Years ago I swapped the daily workplace security for the freedoms of being a stay-at-home writer. With that change came the realization that I missed my coworkers and our daily impromptu discussions about last night’s episode of “Scandal” or what movie isn’t worth the twelve-bucks-plus-popcorn ticket. The chats about kids, cars and diets that I took for granted as part of my workday now come to me via an anytime cyberspace coffee break. I get status updates from my colleagues, my cousins and everyone else in between. I’ve learned 25 Random Things about Fran, my godsister who lives about 3,000 miles from me; chuckled at the variety of Halloween costumes donned by friends and family, and — at Katie’s suggestion — watched a YouTube video sharing a recipe for Loaded Leftover Cups, just in time for that day after Thanksgiving. Usually my posts are innocuous – a home decorating victory, a birthday photo, a book recommendation. Courtesy of my broadband connection, job changes, geography or jammed schedules aren’t hurdles to staying in touch with people who – in big or small ways — have enriched my life. They’re now a part of my day and I have a new place — and an avatar — in theirs. At last check, my Facebook friends’ list had topped 300 and some 1,000+ follow @ClaireFlaire on Twitter. I’m LinkedIn. I have a blog Woman@Heart and author pages on sites like Amazon and Goodreads. Thank you Tony, my second FB friend! Who knew winning a hamburger could be so rewarding? My husband, Nick and I have lots in common. We share the same religion. We’re voting for the same candidate for president. Jeopardy and Blue Bloods are must-see TV. We parent three adult sons and spoil a beautiful granddaughter together. For sure, he’s the man I want bringing me a bouquet of roses and a box of chocolates on February 14. But over the years, I’ve noticed that our personalities collide, a lot. Nick likes westerns. I prefer comedies. I’m a diehard Steelers’ fan. He’s Bolts all the way. My car radio is set to R&B, his to classic rock. I like cake. He’ll take pie. Nick was born in Newark and I’m from a little town near Pittsburgh. I used to wonder if that was the root of our differences. Then I thought, maybe it’s because I’m the youngest of four and Nick is the seventh of nine. Or perhaps it’s because I have brown eyes and his are blue. But the realization of a simpler answer trumped my earlier theories — men and women are different. When I was playing with Barbies, Nick was setting up his Hot Wheels track. When he was being introduced to Barbasol, I was learning about mascara. About three weeks ago, our contrasting preferences became even more apparent when I invited him to go shopping at the mall. I figured that our trip would take up most of Saturday afternoon and part of the evening. Nick was planning on a 30-minute outing (travel time included). Not only do Pinks and Blues clash when it comes to how long a shopping trip takes, we’re oceans apart about what we want to shop for. Ogling the latest in barbecue accessories or scoping out bug spray in Home Depot is Nick’s idea of the ultimate buying expedition. 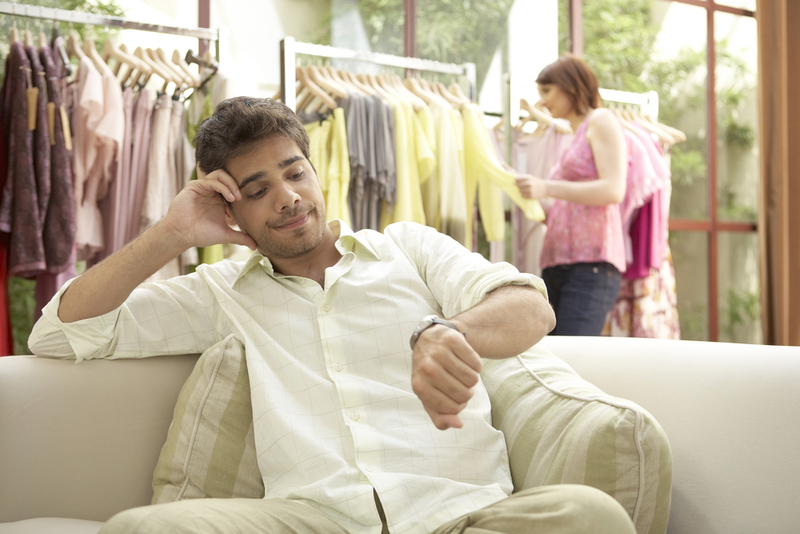 For me the mark a successful mall visit is finding the perfect pair of shoes – no matter how long it takes. Before I became a wife I thought that everyone loved shoe shopping. Nick has since taught me that if you circle Male instead of Female on credit applications, you probably don’t consider footwear as a personal fashion statement. Men and women are on shaky ground when it comes to problem solving too. Women understand that sometimes all you need is a listener who nods supportively and mutters “Hmmmm” at suitable intervals. Just because we pose the question, doesn’t mean we’re looking for the answer. Men, on the other hand, are programmed to fix things — here’s the problem, here’s the solution, end of story. “Boy, I don’t like the way these pants look,” I said modeling them for him. “Ohhhhh, ” he sheepishly replied. It’s true that I might be from Venus and sometimes Nick wishes he was on Mars, but after many years of marriage, we’re proof that opposites attract. It may be a girl thing and it might be a guy thing. But one thing’s for sure – thanks to an odd-colored pair of Capri pants, come next Valentine’s Day I’ll be getting a larger bouquet of roses. And that box of chocolates I told you about earlier, it’s certain to be a three-pounder.